Micromax Doodle 3 A102 was launched in Apr 2014 which was quite an ago from now. The smartphone by that time was rocking with an appealing Price tag. Micromax A102 comes with 6 inches of screen, the battery capacity of 2500 mAh and price tag of 6649/-. As Micromax A102 is quite old these days, the phone may lead to some problems like not booting, soft brock, boot loop, scree blink, touch response issue, etc. This issue can come du to junk files, malware or system malfunctions. These issues can be fixed by flashing stock Firmware on Micromax A102. This article provides you Micromax A102 flash file Download and Procedure. Also explains advantages of flashing Micromax A102 flash file. Flash Stock file of Micromax A102 can fix issues like phone slow, screen blink, automatic restart issue. Micromax A102 flash File will clean and unroot your device, this fixes any problem led by root apps. Flashing Micromax A102 requires some pre-requisites. these are listed below. Flashing Procedure of Micromax A102 is given below. Step6: Click on Scatter-loading and open scatter file from the downloaded stock folder. Step8: Now power off your phone and remove the battery (if it is removable) and connect it using the USB cable to your computer. After completion turn on Micromax A102 and setup your device. This will reset your Micromax A102. 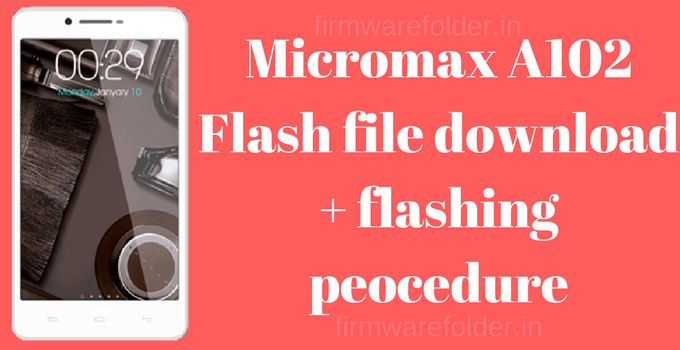 Hope this guide of Micromax A102 flash file download and flashing procedure could be helped you.